Prior to the Davis Cup Angel, Cesar, Gerry, and Miguel participated in the ball kids tryouts and all four of them were selected to be ball kids throughout the three days of Davis Cup matches. First day of the Davis Cup matches. Early in the morning all out scholar athletes headed out to prepare for the big day. Our ball boys went off to their last practice to work out all the last kinks. The rest of our Scholar Athletes went off to their seats setting up their pompoms and clappers ready to cheer on the US Team. It was a epic match up first match Jack Sock V.S. Marin Cilic. Jack Sock was down two sets to love, but in the third set he brought his game to a completely different level taking the third set, then fourth, and finally clinching the fifth set to take the US team to a 1-0 lead. (4-6, 3-6, 6-3, 6-4, 6-4). The kids were off their seats the entire match, still in disbelief that Jack Sock was able to comeback from a two sets to love deficit, winning in five sets. John Isner made quick work against Borna Coric. Isner serving 22 aces taking it straight sets. (6-4, 6-4, 6-3). Leading the US to a 2-0 lead against Croatia. All the Scholar Athletes were inspired to serve like Isner and preserver like Sock. after day one of the Davis Cup. All the Scholar Athletes and coaches included were still running on the hype from the matches on Friday. But Saturday was a little different instead of singles it was doubles. With one of the greatest double pairings playing for the US, Bob and Mike Bryan were going to play against Croatia's Marin Cilic and Ivan Dodig. 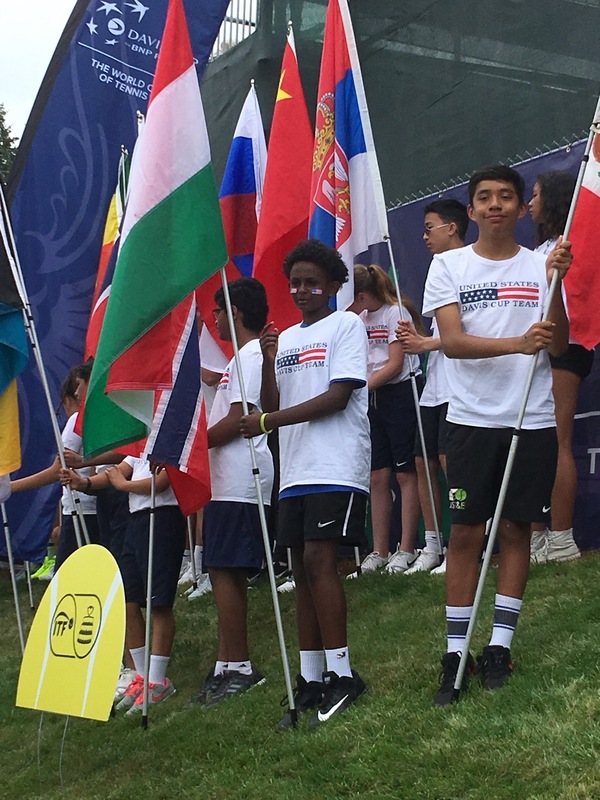 But before the matches started fifteen of our scholar athletes were chosen prior to the matches to be official flag bearers, each carrying and representing countries that participate in the Davis Cup. (Click Here to watch the Flag Ceremony.) It was a long grueling match the Bryan brothers played well, but the Croatian's were able to win the key points in the match winning the match in four sets. (2-6, 6-2, 2-6, 4-6). Turning the score 2-1 US leading. The Scholar Athletes were impressed by how well the Bryan brothers played together and how well they communicated. They were inspired to play doubles like them some day. It was the final day of the Davis Cup with the US team leading 2-1. It was going to be a long grueling day with the sun beating down on the Scholar Athletes, they were all prepared wearing sunscreen and hats. All ready to sit through hours and hours of tennis. The match ups were big serving number one American John Isner against 2014 US Open Champion Croatia's number one player Marin Cilic. It was a tough match for both players, John's massive serve made it hard for Cilic to get a break, and Cilic's superb all around grinding game made it hard to win points against Cilic's service. In the end Cilic was able to clinch a straight sets victory over John Isner. (6-7(9), 3-6, 4-6). Creating a 2-2 tie between the US and Croatia. The final match was going to decide the winner of the quarterfinal match leading to the semifinals. America's young gun Jack Sock was going to face off against Croatia's young gun Borna Coric. It was a tough match for both players as well, Jack's massive serve and forehand had Coric on the defense. Coric's defensive game allowed him to create opening to turn defense into offense. The Scholar athletes continued to cheer on Sock to give him support. But Coric was able to clinch out a victory over Sock in four sets. (4-6, 6-3, 3-6, 4-6). Giving the Croatian's a 3-2 victory coming back from a 0-2 deficit. It was a rough lost for the US crowd. The Scholar Athletes were a bit upset about the lost, but they understood how hard of a match it was for the US Davis Cup team. They understood how big of a opportunity it was for them to be able to witness such a event. They were all inspired to work harder both on and off court to achieve excellence just like all the players.